IT was a defining moment for hardware shop owners in October 2013, when Prime Minister Datuk Seri Najib Razak announced the introduction of the Goods and Services Tax (GST) during his budget speech in Parliament. Everyone stopped working and stared at their television screens. The words came like a death knell for many of the the operators, who were struggling to retain customers in the midst of all the changes the market had gone through in the past decade. Now, they would have to adopt computer technology (something most of them had resisted) and implement GST software. It was all too much trouble. Sighing, many of the small business owners lifted their hands in despair and wearily threw in the towel. A traditional hardware store sells items and tools needed for home improvement projects or repairs, such as hand tools, keys and locks, fasteners and hinges, plumbing supplies and even garden equipment. Under the Goods and Services Tax Act 2014, businesses registered under the new system are required to collect taxes on behalf of the government. They have to declare the amount collected to the Royal Malaysian Customs Department every three months. Thus, these businesses have to be able to differentiate the tax rates that are imposed on each and every good they purchase and sell. They must neatly file away their invoices and other related documents and establish transparent accounts. If they make a mistake in filing their business returns, the Customs Department could fine them as much as RM50,000, imprison them for three years, or both. It all sounded like too much trouble for many of the grey-haired owners who were used to operating in a much more laissez faire environment. But this was not the case for CSM Group managing director Lee Wee Siong. He saw it as an opportunity for his company to raise its game and expand its market share. For the past five years, he had been quietly transforming the company and modernising its operations. He was now ready for battle. In other industries, computers are seen as a tool to increase efficiency and control costs. But in this industry, Lee was seen as a rebel when he started upgrading and modernising his company’s systems. At 34, he was young enough not to be resistant to technology, unlike most of the other much older proprietors who did not have children to take over their businesses. Lee believes that 80% of the hardware shops across the country do not even have a computer. Here’s how the traditional hardware shop works. There is one key person — the proprietor — who keeps all the details of the business, from inventory and purchases to suppliers and customers, in his head. As he is probably not able to remember the price of everything, he writes them down in a book in a series of codes that only he understands. “He will note down the cost of goods in his special code, when they arrive. When a customer asks for a discount, he will check his book to see how low he can go during the negotiation. Everything is top secret,” says Lee. No wonder these companies have resisted the introduction of computers, which would change the way they do business. Like most things, it is about power and centralised control, and everything revolves around one person. For Lee, however, this way of doing business has many disadvantages, especially if, like CSM, you are looking to expand your business and have a chain of stores. “First, the system is not transparent. Second, no one can negotiate with the customers except the boss himself. Everything depends on your relationship with that particular customer,” he says. And finally, since the business is not transparent or the financials clearly recorded, what will happen when the officers from the Customs Department come round to check on the accounts? That is why many of these elderly hardware shop owners decided to give up their business, instead of changing the way they operate and adapting to the new environment. To his credit, Lee had foreseen this a long time ago. He knew he would have to turn his operations into a transparent, manageable and replicable business if he wanted to set up a chain of stores. He knew that IT was not a threat but a solution. previously been able to bargain and get a discount on the goods, felt they were being shortchanged. So, they took their business elsewhere. Lee watched his company take hit after hit. Should he just give up on the idea? Was the business ahead of its time? 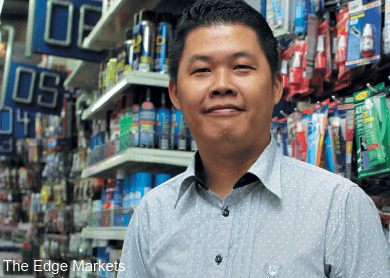 Would hardware stores in Malaysia ever change? He decided to wait it out, convinced that business would pick up. He had faith because, even though he had fixed his prices, he had also lowered them as much as possible so that customers would not have to bargain. That way, they got the “discount” anyway. The customers found that he was right. And eventually, they came back. But it took four nail-biting months for Lee to see his first victory. Now, he plans to open 10 stores over the next five years. CSM invested RM1 million to upgrade its computer system three years later. In 2014, it won the SME ICT Adoption Award, which was a part of the SME Recognition Award 2014 organised by the SME Association of Malaysia. Lee says he could not have done all this without the help of his two brothers-in-law — Chong Yuen Fatt and Lee Tian Seong. As a family-run business, CSM did not have a lot of resources. Every sen it made was reinvested in the business. When he decided to computerise operations, he couldn’t afford outside help, so he looked for the right resources within the family. In 2005, he approached Chong, who is married to his elder sister. “Chong had done a course in information systems in college. My sister and I persuaded him to join us and apply his knowledge to transform this old industry,” Lee says. This proved to be a wise decision. Chong had previously worked for an industrial blade manufacturing company, so not only was he able to help CSM computerise its operations, but he also established CSM Hardware Marketing Sdn Bhd and helped the company venture into the industrial blade manufacturing business, which would prove to be an important source of income. No one expected the company to do as well as it did. Three years after Chong built its first IT system, it was no longer able to handle the business which had grown at a much faster rate than anticipated. The store was offering a larger variety of products and things became too complicated for the simple system Chong had set up. Lee brought Tian Seong to the shop and showed him the transformation that was taking place. He showed his brother-in-law that he was serious about changing the way business was done. When Lee sets his mind to something, he can be very persuasive. So, once again, the company upgraded its computer system to cater for the increased complexity of its business. But Lee did not stop at that, he constantly looked out for business opportunities. He invested in property and started a whole series of related businesses. The group now comprises CSM Hardware Holdings Sdn Bhd, CSM Hardware Sdn Bhd, CSM Engineering Hardware (M) Sdn Bhd, CSM Power Centre Sdn Bhd and CSM Hardware Seksyen 27 Sdn Bhd. Last year, it achieved a turnover of RM50 million. “All these companies are grouped under CSM Hardware Holdings Sdn Bhd and have the same management team. The team makes all the important decisions and supervises the different businesses. We are now more than prepared to start opening the other stores in our chain,” Lee says. Lee has effectively differentiated his company from other traditional hardware stores, but he is not resting on his laurels. He has set his sights on much bigger game, and now regards Mr. D.I.Y. and ACE Hardware as his main competitors. They may still be ahead of the pack, but Lee plans to raise his game so that CSM can catch up and eventually take the lead. Mr. D.I.Y. has set up more than 100 shops across Malaysia, while ACE Hardware has more than 16 branches nationwide. CSM is not there yet, but is determined to achieve its target. The company has generated a lot of brand recognition with the 15,000 sq ft CSM Hardware City in Shah Alam, Selangor, which offers customers a large variety of hardware products. It also has a smaller shop in Section 27 of Shah Alam. “That is why we aim to open 10 stores over the next five years. It is a crucial part of our strategy. We need to build up our volume,” Lee says. Local competitors are not the only ones CSM needs to be wary of, though. With the formation of the Asean Economic Community by the end of this year, competing businesses from neighbouring countries will be another threat to its ambitions. For instance, HomePro, the most famous hardware chain in Thailand, set up shop in Malaysia this year. It plans to open 12 branches over the next five years. “They are very aggressive and our market share will slowly erode if local players are not prepared to work harder,” says Lee. Nevertheless, he thinks that stores such as HomePro, ACE Hardware and Mr. D.I.Y. will continue to focus mainly on hardware for home use. For the time being, no company has set up a chain store that provides hardware for both home and industrial use. CSM plans to be the first. This article first appeared in Unlisted & Unlimited, The Edge Malaysia Weekly, on March 09 - 15, 2015.